Get the February 2019 Mission Link newsletter from El Camino Real District UMW. 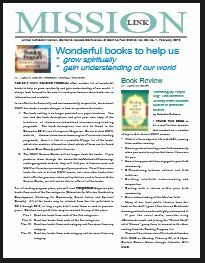 The printed & mailed issue included the information/registration and scholarship forms for Mission Springs Spiritual Retreat, which can be found here. Changes from the printed version include removal of personal contact info for District Team members. Next issue will be published in early May 2019. Please submit articles & photos to Communications Coordinator before Tuesday, April 16, 2019. This entry was posted in Mission Link, News and Events on February 9, 2019 by Wanda.